Originally meant to serve functional purposes, headboards now-a-days have become an important decorative element in a bedroom. Along with creating attention catching focal point, a headboard also helps in further defining the interior style you are going for. If you find your bedroom lacking, then read below for some awesome ideas on headboards and be inspired to pep up the most personal room of your house! Art love! If you are the arty types and love to display your cherished collections in every part of the house then don't hold back, an art piece can also serve the purpose of an attention catching headboard! Along with adding an artistic twist, this 1854 textile hung in place of a headboard gives an antique and soft look to the bedroom! Pep up with pattern! Finding your bedroom a bit plain? 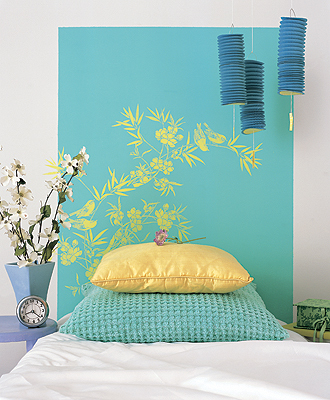 A headboard covered in a colourful patterned fabric would be a great update to enliven an uninteresting room! Modern and sleek! Fancy a clean, modern look? Then your idea of a stylish headboard would be to go for a sleek and clean-lined headboard with low height in order to keep in harmony with the minimalist style. We love this streamlined headboard, and the pattern of sleek lines on it only adds to the modern look! Some texture! Along with the extra comfort and the cushiony feel they bring in, we love us some upholstered tufted headboards for the texture that they have to offer. Look below! Sculptural element! While wooden headboards are considered more traditional, to make an eclectic statement we recommend you use a headboard sculpted out of wrought iron! Faux headboards! Find headboards bulky for your space? Well then replace your old headboard with a new and funky faux headboard. Look at the below examples to know what we are talking about! To keep in harmony with the simple and minimal look of the bedroom, a faux headboard is created by painting the wall in a vibrant colour! Rustic-chic! We are always excited to see some rustic elements thrown in here and there; not only do they offer a great contrast polished surfaces, but also provide a rugged, aged character to a polished space. We think headboards are a great way to introduce that rustic touch in your bedroom. Look how! Dramatize! Over-sized elements are a sure shot way of adding some dramatic flair to a space, and headboards are no exception to this rule! This colossal tufted headboard is not just a dramatic treat to the eye but it is also quite luxurious! The gigantic headboard in this extensive space is quite overwhelming, but we're not complaining! It offers just the right dose of drama to this unconventional bedroom! Supersize that! Oversized mirrors and how they can transform your space. Unique furniture by Aqua Creations!